We’ve seen people get in car accidents, often experiencing huge damages in their vehicles that are far too serious than what one can imagine. Regardless of who’s at fault or the amount of damage that was made, reporting the damage to a designated body is important for a number of reasons. 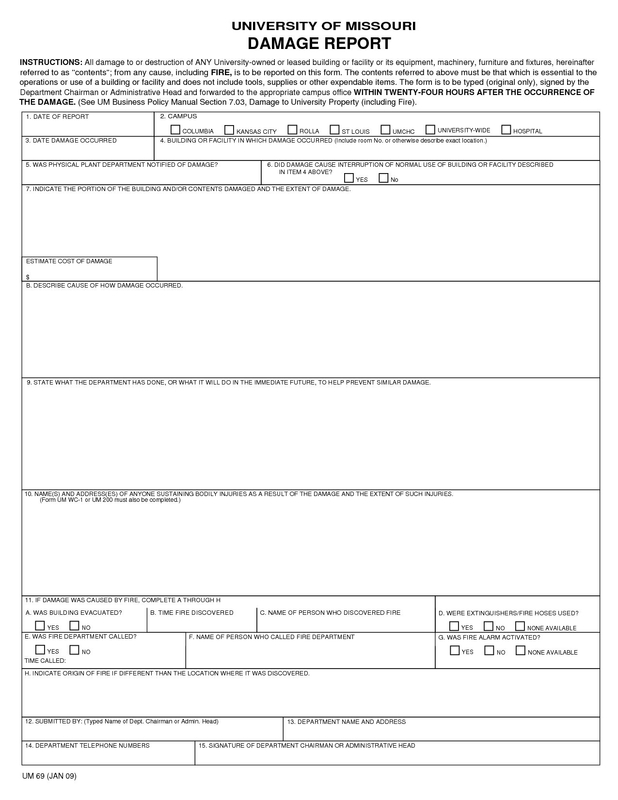 Similar to an incident report, a damage report must be filed immediately after its occurrence. The document will then be evaluated for further assessment. However, most people are still unfamiliar with how damage reports are created. This has forced many individuals to simply ignore this step and settle with the costs and expenses themselves. 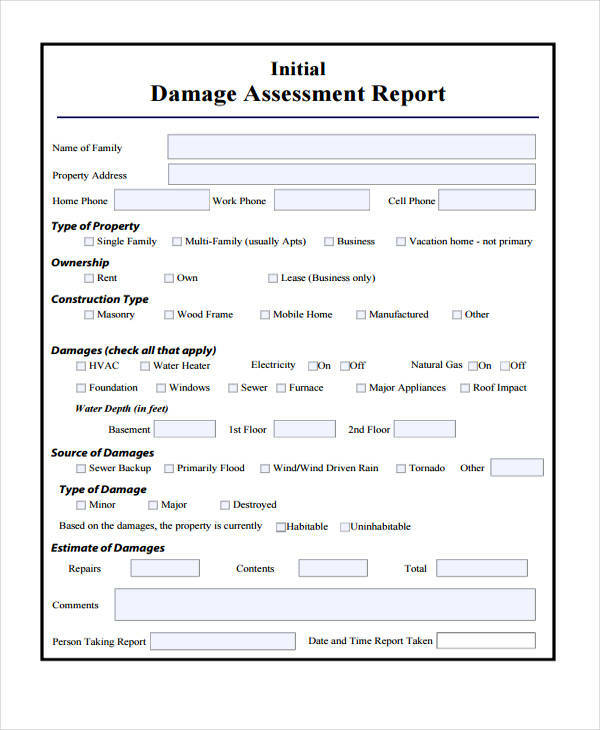 So in this article, we tackle the principles of damage assessment and the guidelines on how damage reports are written for you to refer to. Damage assessment plays a crucial role in a community’s response and recovery system following a hazardous event. This is a process used to determine the severity and magnitude of a disaster or emergency situation that has taken place in a community. You may also see investigation report samples and examples. The information gathered in the general report provides a glimpse of the circumstance at hand by detailing the extent of the damages as well as the location of such. This sets the tone for the entire response and recovery operation to help obtain meaningful results. Even if the damages caused by the incident were only minor and that there were no casualties in the area, authorities still suggest that victims file the report for record keeping. Effective damage assessment also helps the community set priorities in terms of response activities such as the search and rescue of tragedy victims, and recovery operations such as the removal of fallen debris from a site. Here, damage assessment response teams are often dispatched throughout the area to accurately quantify the damage and estimate possible repair costs, which mostly focuses on the habitability and property value of the damaged infrastructure. You may also like business report examples. In some cases, the response team may have to visit the area more than once if it wasn’t accessible during its initial assessment. This usually occurs when the area is too dangerous for the response team to enter due to the presence of hazardous chemicals or when the infrastructure may be too unstable to carry additional weight. You may also check out academic report examples. The severity of a situation can be measured through a variety of factors, including the number of people affected, the amount of capital lost, the number of buildings uninhabitable, and its impact to critical infrastructure and key resources. You might be interested in project report examples. This is usually determined using technical measures that are specific to the given hazard. Various instruments are used to measure the magnitude of an event, all of which are specially designed to identify the intensity of the disaster. For instance, the magnitude of an earthquake is measured using the Richter Scale, while the magnitude of a hurricane is measured by the Saffir-Simpson Hurricane Wind Scale. All of these scales are measurements based upon the analysis generated from previous catastrophic events. You may also see report writing format examples. 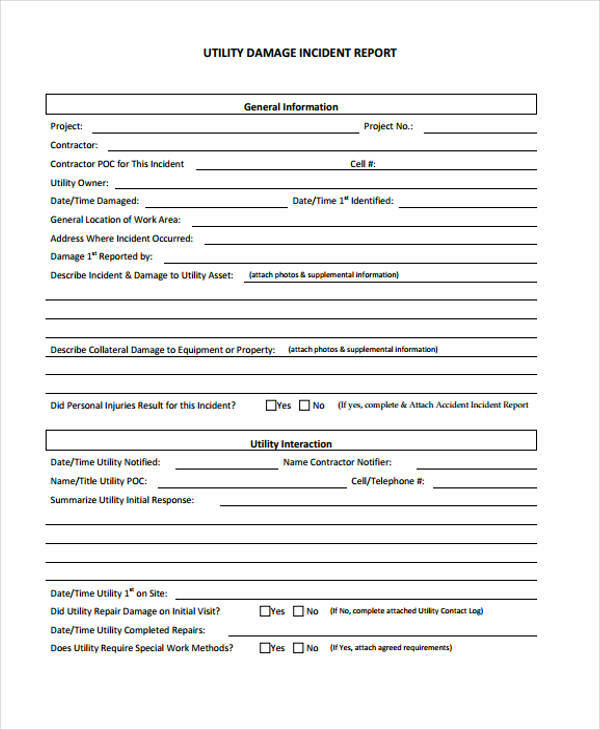 A damage assessment response team typically consists of experienced individuals who are sent to evaluate and document the damage caused by an incident, along with its potential impact on the community. Although some members may be part of the team voluntarily, it’s important for the response team to be composed of individuals from various groups and functional areas within the community. A diverse set of skills and expertise will greatly contribute to the success of the general assessment. These components are essential toward the health and welfare of the population of a community. Public safety services, health care utilities, transportation systems, and lifelines are all classified as critical infrastructure and key resources which may cause potential loss or release of hazardous materials. You may also like English report writing examples. This procedure provides vital information in regards to the extent of a damage. The information collected is then used to identify where resources must be directed and whether or not they would be sufficient to respond to and recover from the event. If necessary, state or federal assistance may be required. You may also check out status report examples. It’s been said before, but the importance of a damage assessment cannot be overemphasized. This is a vital process in determining how a particular event happened and how it has affected a group of individuals and the community as a whole; how residential, business, and infrastructure properties have been affected; which areas were hit the hardest; which cases must be provided response priority; as well as the types of assistance needed. You may also see technical report examples. Damage reporting must also be done accurately and timely. This is crucial to successfully request state or federal assistance through low-interest loans for victims of the tragedy to recover. The reports will be used to design the recovery process, in which the costs for the operation would be determined as well. 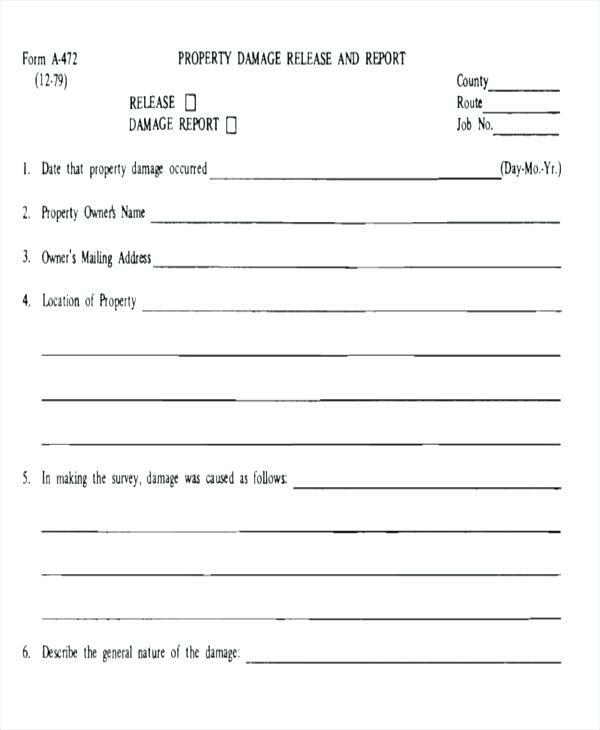 These general reports are typically produced along with an incident or accident report if (and only if) property damage has been identified. For documentation purposes, the report would also serve as a physical record to prove that a particular event did happen for future investigations or references. 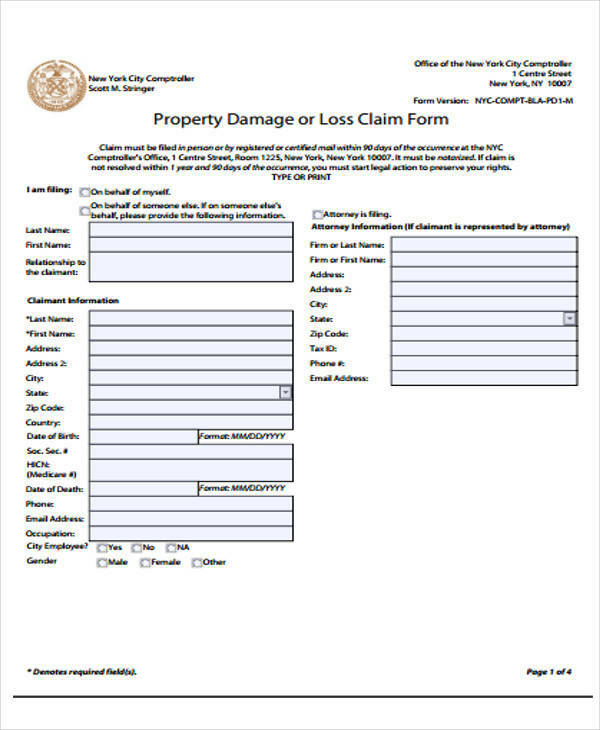 Damage reports are filed following a disaster caused by human negligence, regardless of fault (like a car accident or a burning house), or natural calamity (like an earthquake, tornado, or tsunami). 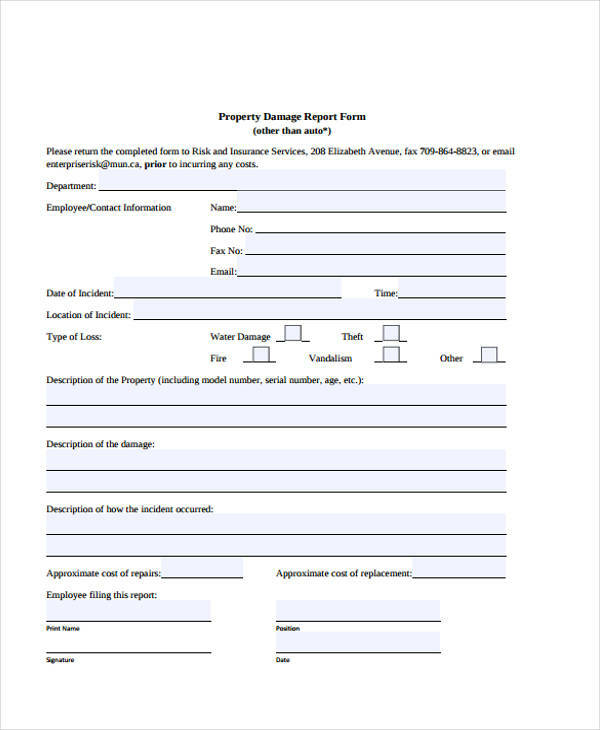 In many cases, damage reports are filed to record a claim as requested by an insurance carrier. You may also like quality report examples. Insurance companies usually require clients to create a simple report that covers what happened and where it happened. This must be done promptly so that evidences of the said event may still be used as proof. Once a damage report has been filed, the insurance company would conduct an investigation to see whether the damage was accidental or not. Unfortunately, there have been cases where a supposed accident was caused intentionally by the victim in hopes of receiving some sort of compensation (money) for the incident. If the investigation performed by the insurance company proves that the damages were purposely made, then the victim may face legal consequences and would not be granted financial assistance. You may also check out management report examples. Since a damage report plays a key role in determining how an incident should be handled, it’s important for us to know how these documents are created in the event of a disaster. 1. Follow a standard format. There are many templates and examples found in this article and online that you could use as a guide. If you have any further questions or concerns with the format and content of the formal report, you could always consult a legal professional for proper assistance. 2. Write the report immediately. File the report as soon as you can. If possible, you could write it on the same day of the incident. Any delays in the process can cause problems along the way. For instance, failure to make the report could raise a few questions on the authenticity of the incident. Some people may even assume that you were hiding something vital to the case. A delayed report may also lack evidences to prove that your claims are true, like if the scene of the incident has been wiped clean or if there isn’t sufficient evidences to prove that such damages were caused by the exact incident stated in your report. Similar to a police report, a damage report must be written immediately after an incident for a quicker and easier response. 3. Describe the scope of the damage. Explain everything that happened in a first-person narrative. This must be done thoroughly and accurately as well. Describe each phase of the event in a logical sequence, specifically what occurred before, during, and immediately following the incident. You should be able to provide an in-depth analysis on what caused the incident from a personal standpoint. Be as descriptive with your general analysis as possible. Given that there are three sides to every story, your claims can contribute significantly to the investigation. Make sure to share the specifics with authorities. If necessary, you can also collect photo and video evidences using your smartphone or camera (if you have one on hand) to illustrate the type or extent of the damage. 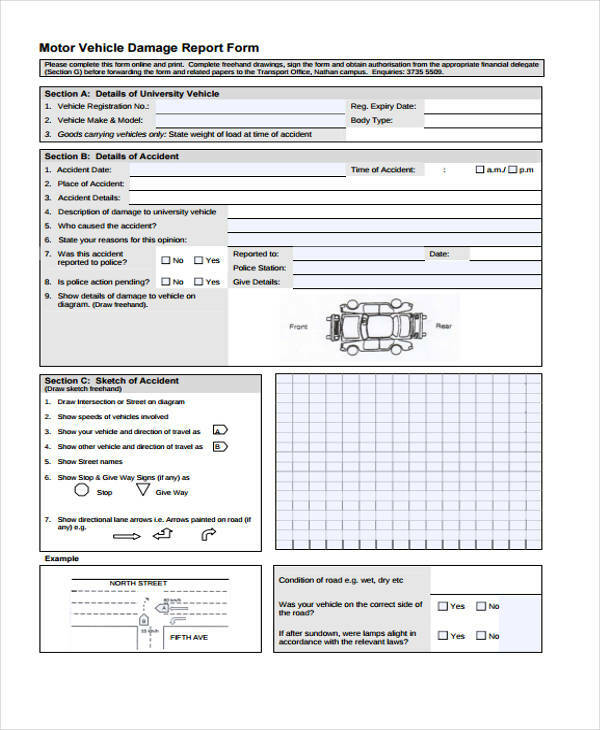 This will make it easier for the assessment team and the insurance company to analyze your report. You may also see examples of short report. The scene of the incident and the damage to other properties or vehicles in the area must be recorded as well. Whatever you do, do not discard the damaged material or equipment, as the authorities and the insurance representative may need to evaluate it to help in their investigation. You may also like marketing report examples. Furthermore, provide your own evaluation of the incident along with estimations on property damage and costs. 4. Make it clear and understandable. Avoid using big, flowery words that only make it harder for people to grasp your message. It’s best to use simple language to prevent confusion or misinterpretation. 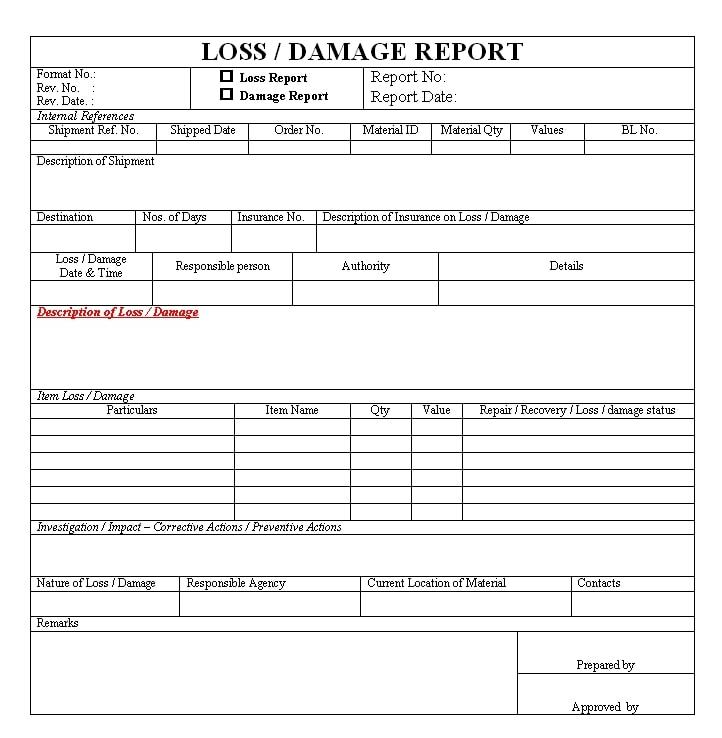 Vague words and sentences may sound great in writing, but when crafting something as professional as a damage report, they only act as a distraction from the document’s main purpose. You may also check out sample activity reports. Be sure to focus on your main objective when writing: to deliver sufficient and relevant information in regards to the incident. Try not to be biased with your claims, as this may only complicate the situation. Keep it brief yet detailed enough for readers to properly visualize what happened. You might be interested in consulting report examples. Finally, review the report for any grammar or spelling errors you may have committed. It would also be necessary to double-check the facts provided, as you may have missed or overlooked some details essential to the report. You may also see sales report examples. If you hold any critical information but forgot to include it or chose to exclude as you filed the report, you may have problems using it to your defense. If possible, you can ask a lawyer, or somebody reliable with you at the moment, to assist you in filling the report. You may also like research report examples. 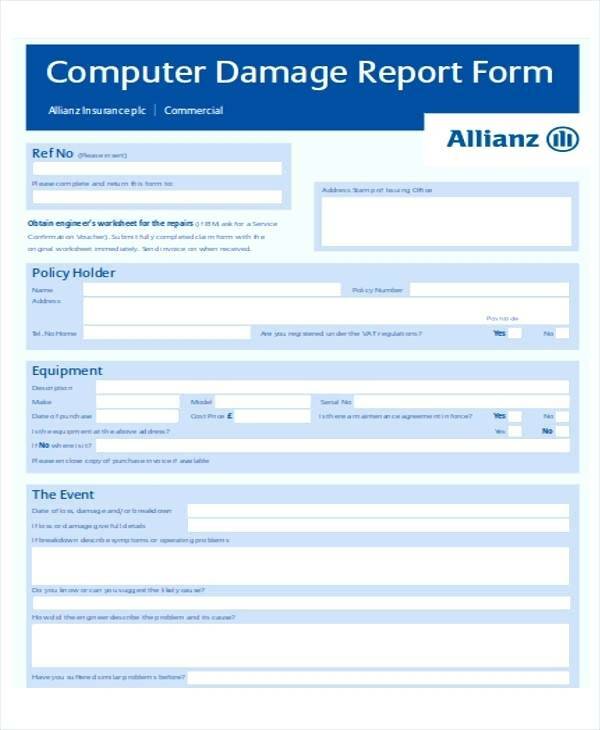 Like any other form of report writing, damage reports must be written with clarity. It must provide readers with all the information that they need to know about a particular incident to help them investigate the cause and the response necessary to the event. This way, victims may receive the assistance that they need to recover from an unfortunate tragedy, whether this is through government assistance or insurance loans. So if you ever find yourself stuck in a situation which requires a damage report, make sure to refer to these guidelines and examples for successful writing.